Stolen from her family as an infant, a prize-winning poet recounts her arduous journey to reconnect with the Aboriginal culture of her birth. 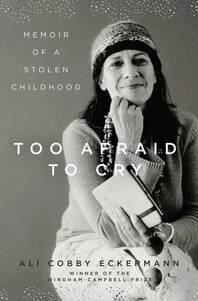 In Too Afraid to Cry, Ali Cobby Eckermann—who was recently awarded the Windham-Campbell Prize, one of the most prestigious literary awards in the world—describes with searing detail the devastating effects of racist policies that tore apart Indigenous Australian communities and created the Stolen Generations of “adoptees,” Aboriginal children forcibly taken from their birth families. Told at first through the frank eyes of a child whose life was irretrievably changed after being “adopted” into a German Lutheran family, Too Afraid to Cry braids piercingly lyrical verse with spare prose to tell an intensely personal story of abuse and trauma. After years of suffering as a dark-skinned “outsider,” Eckermann reveals her courageous efforts to reconcile with her birth family and find acceptance within their Indigenous community. Too Afraid to Cry offers a mirror to America and Canada’s own dark history of coerced adoption of Native American children, and the violence inflicted on our continent’s Indigenous peoples.